Dr. John L. Roussalis is a Board Certified Plastic Surgeon who joined Premier Dermatology & Cosmetic Surgery after running his own practice in Casper, Wyoming. He completed his undergraduate education at the University of Notre Dame where he received his Bachelor of Science degree. He then went on to receive his Doctor of Medicine in 2000 from Creighton University School of Medicine in Omaha, Nebraska. He completed his general surgery training from Summa Health System in Akron, Ohio and is also Board Certified in general surgery. 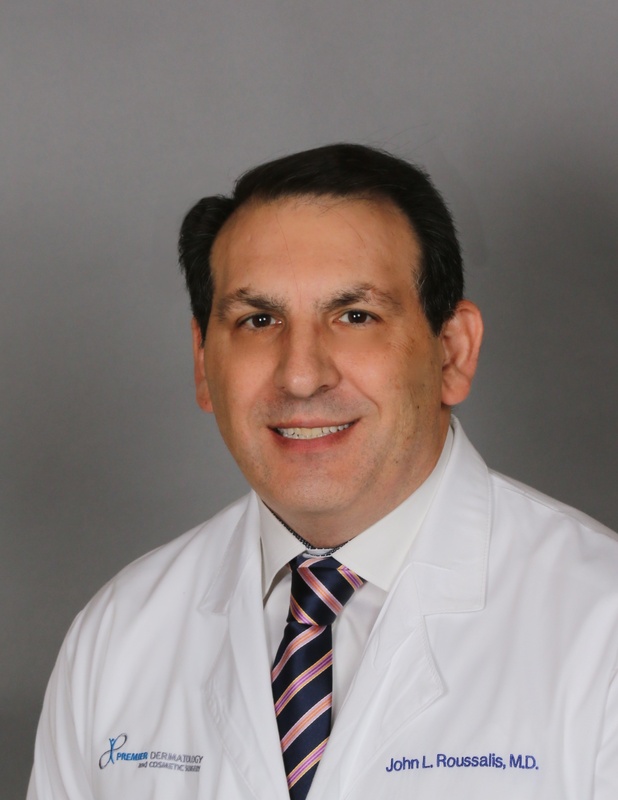 He did his fellowship in plastic and reconstructive surgery at Temple University in Philadelphia and became board certified in Plastic Surgery. Dr. Roussalis was selected as chief resident during his training in general surgery. During his last year in plastic fellowship, he was selected chief fellow and spent time at Memorial Sloan Kettering Cancer Institute in New York City specializing in breast reconstruction for breast cancer. He also worked with several local collegiate and professional sports teams in the Philadelphia area as Temple University is a regional hand center. Dr. Roussalis is certified by the American Board of Plastic Surgery. He is skilled at all cosmetic and reconstructive procedure including breast enhancement, liposuction, breast reduction, breast reconstruction, tummy tucks, mommy makeovers, and post-bariatric surgery. He participated in martial arts at Notre Dame and Creighton University, where he received his second-degree black belt. He also enjoys tennis, skiing, outdoor activities, reading science fiction, and spending time with family and friends.